proud taxpayer, and twice a day! Five years ago the big holes were already there, in the middle of Dusseldorf city center, and last year they were closed. The new underground, “die Wehrhahn Linie” was inaugurated. 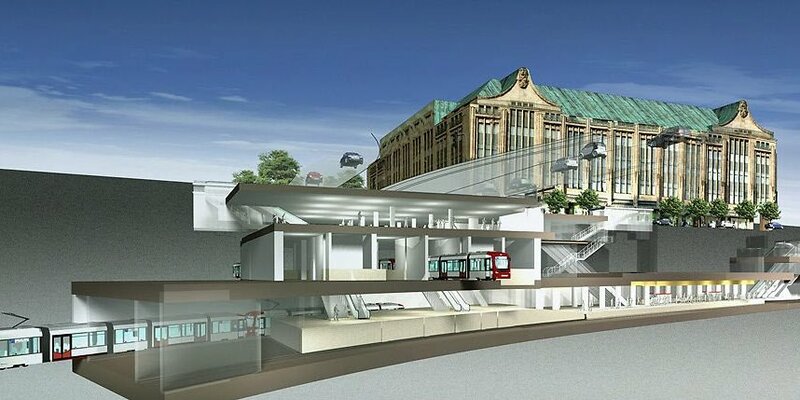 This was part of an integrated project which included subterranean speedways, the tearing down of the Tausendfüβler viaduct as well. The new stations are among the most spectacular I’ve seen so far around the world, with super-high ceilings, some have even natural light filtering through an ingenious system. And art. Have a look at this super-interesting video…among various big machines, it shows starting at minute 07:29, Tuborine, the tunnel-beast which has been powerfully – yet delicately – digging thru Dusseldorf city center over the past 5 years…fascinating machine, and fascinating operations (and tough jobs! ).